Background: Small bowel obstruction (SBO) after open abdominal exploration for trauma is associated with significant long-term morbidity. Open exploration may be required if conservative treatment is unsuccessful. Laparoscopy in these patients may decrease LOS and decrease the rate of complications associated with repeat open surgery. Most inner city trauma centers are not geared for advanced laparoscopy. In this study, we define patients, who are amenable to laparoscopic approach in trauma centers with minimal facilities for advanced laparoscopy. Study Design: This study was conducted in an inner city, underserved trauma center. 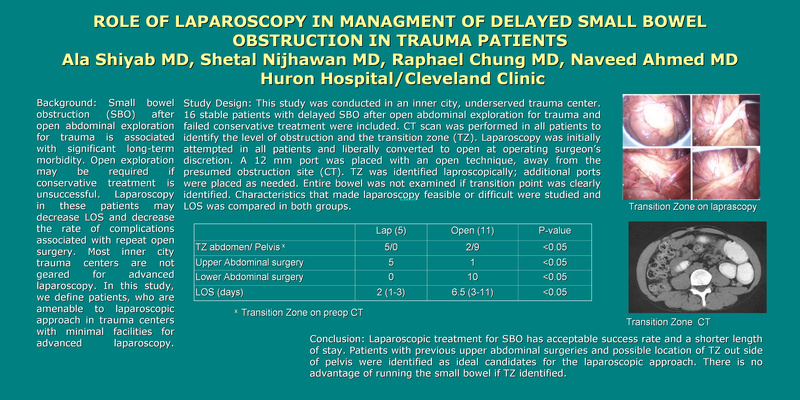 16 stable patients with delayed SBO after open abdominal exploration for trauma and failed conservative treatment were included. CT scan was performed in all patients to identify the level of obstruction and the transition zone (TZ). Laparoscopy was initially attempted in all patients and liberally converted to open at operating surgeon’s discretion. A 12 mm port was placed with an open technique, away from the presumed obstruction site (CT). TZ was identified laparoscopically; additional ports were placed as needed. Entire bowel was not examined if transition point was clearly identified. Characteristics that made laparoscopy feasible or difficult were studied and LOS was compared in both groups.Conclusion: Laparoscopic treatment for SBO has acceptable success rate and a shorter length of stay. Patients with previous upper abdominal surgeries and possible location of TZ out side of pelvis were identified as ideal candidates for the laparoscopic approach. There is no advantage of running the small bowel if TZ identified.